Small cameras and small tripod alternative supports go together like hand in glove. Cameras are definitely getting smaller, lighter and easier to carry. Even DSLR models have shed considerable weight, at least in the consumer models and some come in at just over a pound. At the other end of the spectrum is the point-and-shoot which is usually pocket size and weighs just a few ounces. In between are the compact or bridge cameras and mirrorless cameras. HandlePod offers improved leverage and a better grip for hand holding small compact cameras. No matter what camera you use, all can benefit from camera stabilization in low light. HandlePod will support any camera from a consumer DSLR with a kit lens down to the smallest point-and-shoot. The smaller the camera, the greater the need for stabilization in low light. 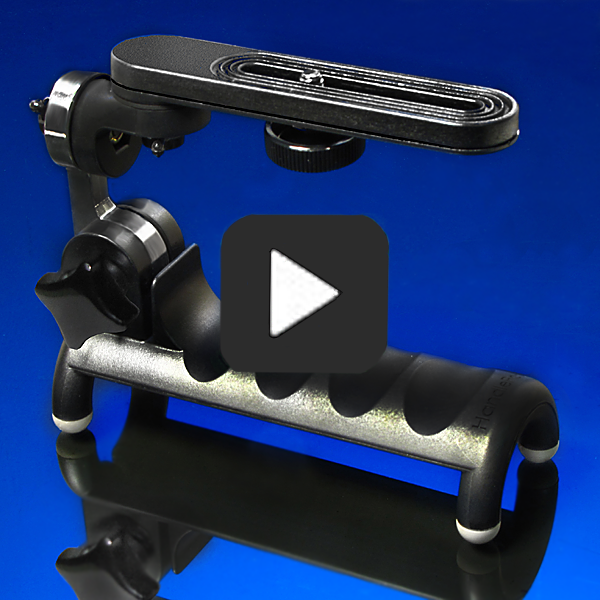 HandlePod offers three methods to stabilize cameras of any size: 1. It’s a handle for a firmer grip and better leverage for hand held shots. 2. It provides tripod-like stability when pressed by hand against any solid support. 3. It attaches to support objects with an elastic cord that is strong and completely reliable. Other factors typical of cameras today influence the need for camera stabilization. One is use of an LCD monitor as opposed to a viewfinder. Film cameras all had an optical viewfinder so you could brace the camera against your head, a much more stable position. Today many cameras have done away with the eyepiece viewfinder altogether and rely completely on the monitor. Holding the camera a foot or more away from your eyes to see the monitor is a much less stable stance. Camera movement is more difficult to avoid and can cause blurry low light exposures and shaky, less stable video. The improved grip and leverage that HandlePod provides yields sharper low light stills and more solid, shake free video. Compact cameras with extreme optical zoom lenses, sometimes called ultrazoom, also could use more stabilization than hand holding alone provides. These cameras are extremely difficult to keep steady when zoomed in at 60x or more. This is especially noticeable when shooting video. But zooming in that close for stills in low light demands stabilization to avoid blur from camera shake. HandlePod provides a significant measure of stability for cameras with such extreme zoom ranges. The pocket size, four-ounce HandlePod is the perfect tripod alternative for today’s smaller, lighter cameras, especially those with extreme zoom and no eyepiece viewfinder. This entry was posted in Camera Stabalization, Hand Held Stability, Low Light Photography, Shake Free Video, Tripod Alternative on May 12, 2015 by main user.